It’s now 2017, the year when Epcot will mark its 35th anniversary. (EPCOT Center had its grand opening on October 1, 1982.) World Showcase guests can still enjoy the brilliant Imagineering work that captivated opening day guests. 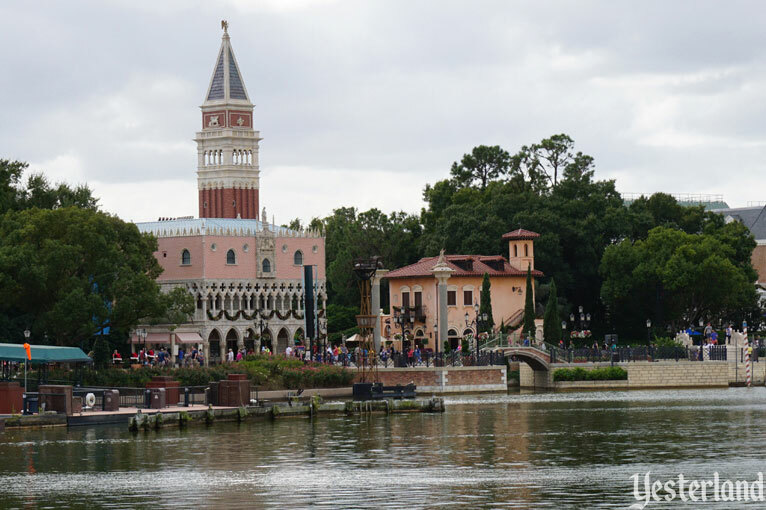 Yesterland photographer Chris Bales recently visited Italy, while I visited Walt Disney World. We emailed photos back and forth across the Atlantic Ocean. The results are this article. , Curator of Yesterland, January 6, 2017. 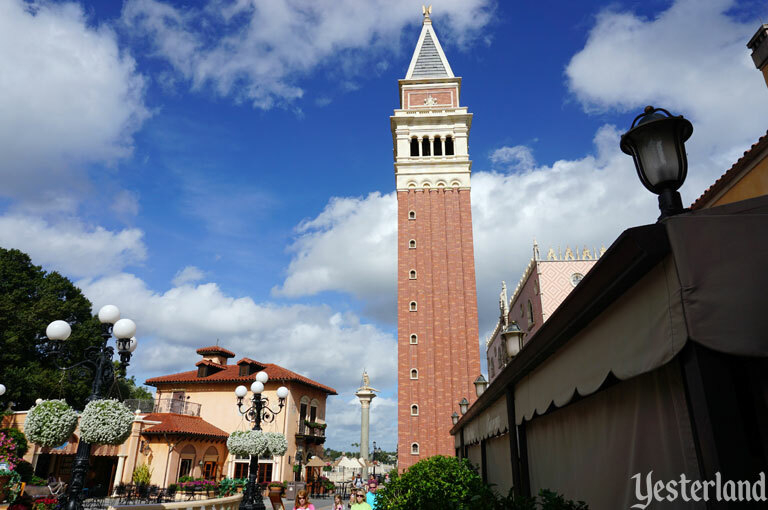 There’s a distinct resemblance between the real and Epcot views above, although Venice’s Palazzo Ducale (Doge’s Palace) and its Epcot counterpart are positioned quite differently in relation to the bell tower. Epcot’s Enoteca Castello building, with its stucco walls and red tile roof, represents rural Tuscany, not Venice. 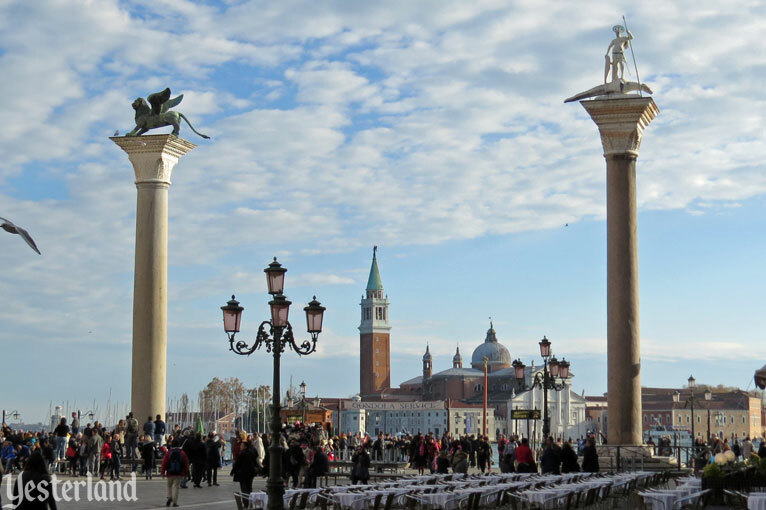 Two twelfth-century granite columns topped with sculptures mark the entrance to Piazza San Marco (St. Mark’s Square) in Venice. 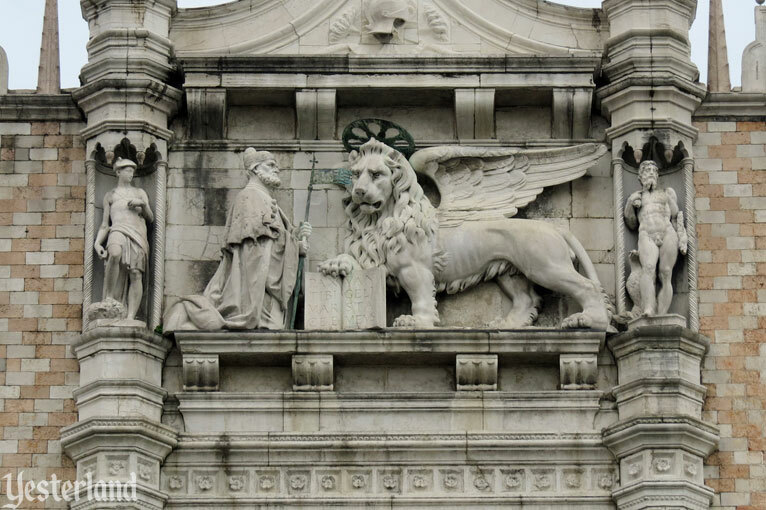 The winged Lion of Venice has become a symbol of the city. St. Theodore is supposed to be standing on a dragon that he just slew, although it looks like a crocodile. 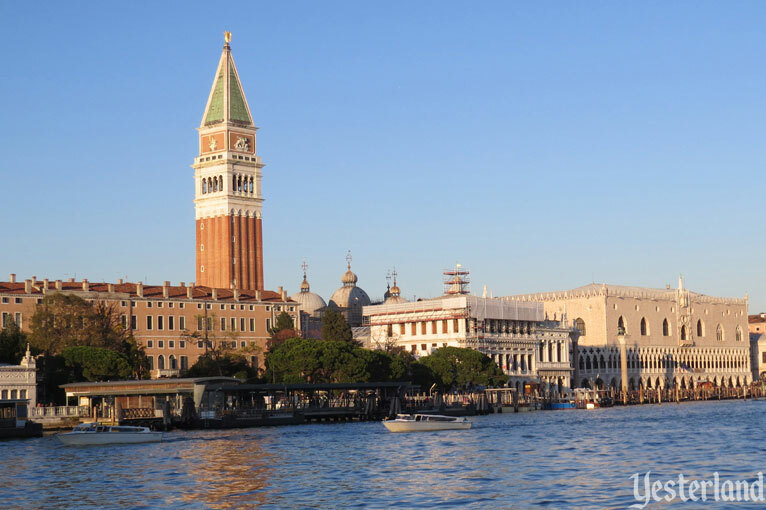 The tower in the background of the photo from Italy is the San Giorgio Maggiore bell tower. 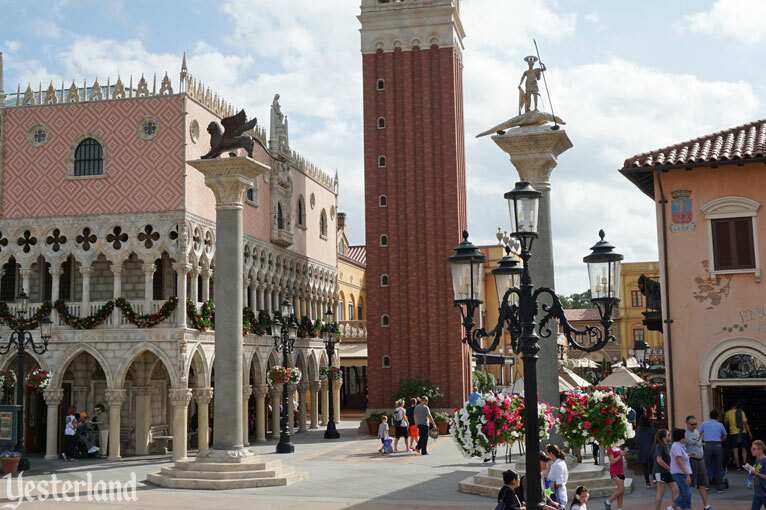 It’s on the other side of the Grand Canal from Piazza San Marco, and is not the tower represented at Epcot. 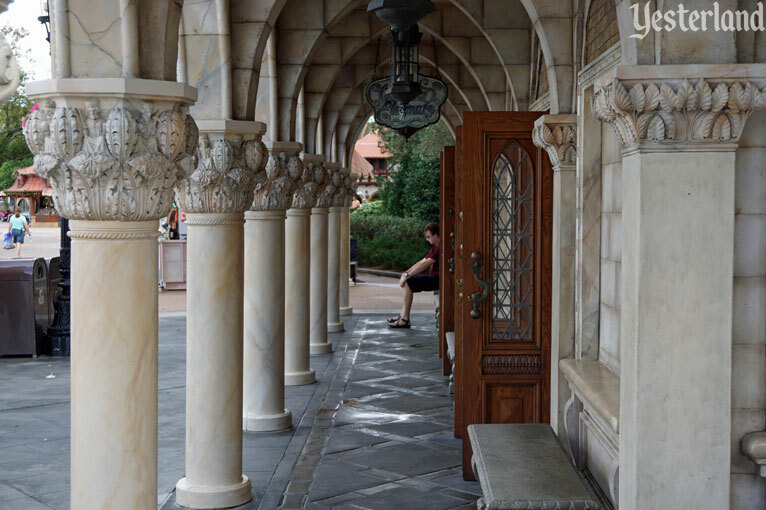 At Epcot, the columns look similar, but are closer together and shorter. The sculptures appear to be faithful replicas. 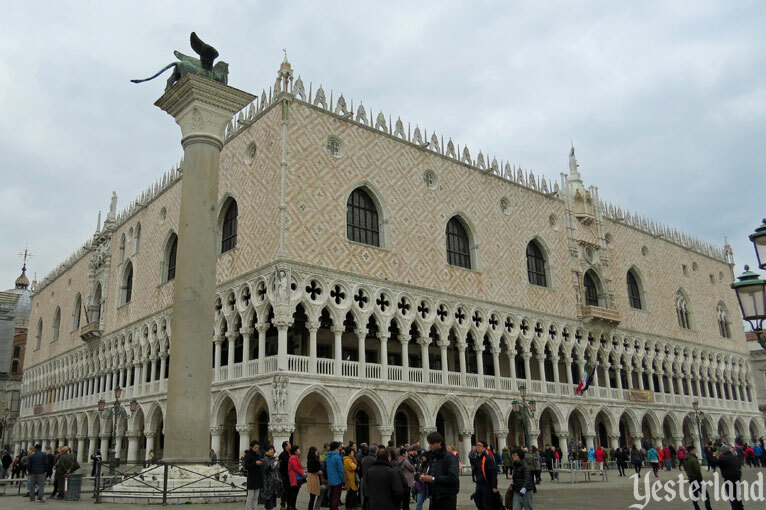 Historically, the Palazzo Ducale (Doge’s Palace) was the residence and seat of government of the Doge, the leader of Venice. With its landmark Venetian Gothic exterior and spectacular interior, it’s one of the top attractions of Venice. 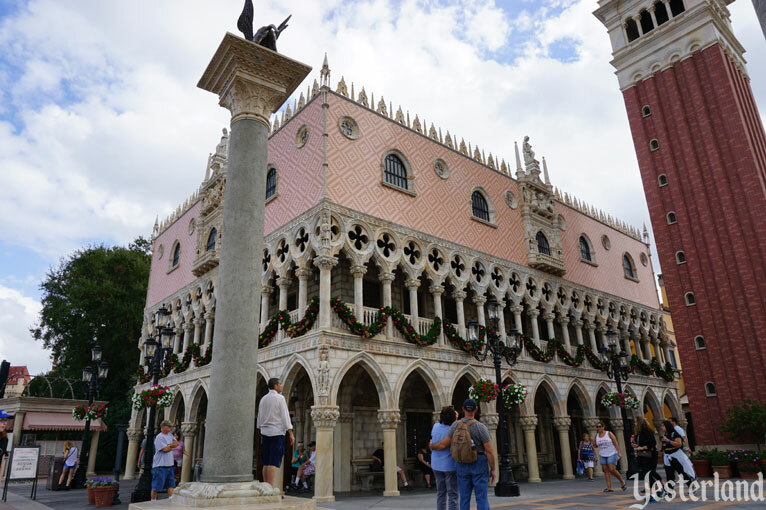 The exterior of Il Bel Cristallo shop at Epcot is a “shrink and edit” version of Palazzo Ducale. Inside, it’s an attractive store with Italian goods—including very, very fragrant perfume. 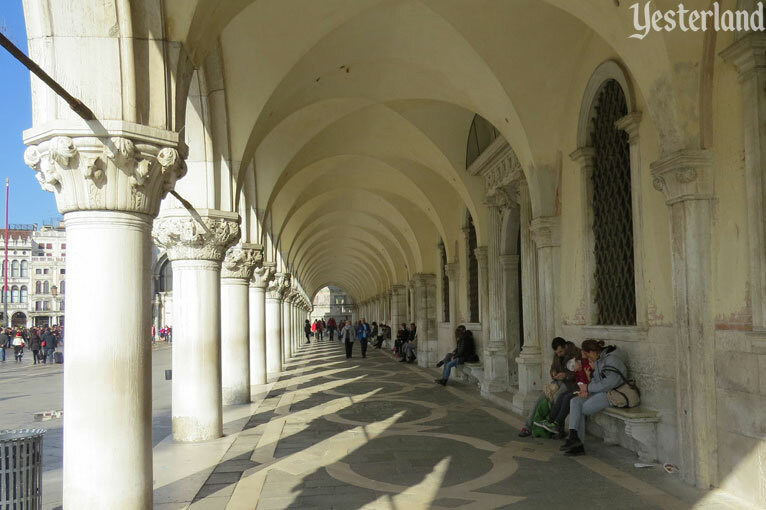 The amount of “shrinking” and “editing” applied to the huge Palazzo Ducale becomes especially obvious at the much shorter, much narrower, much lower arcade. 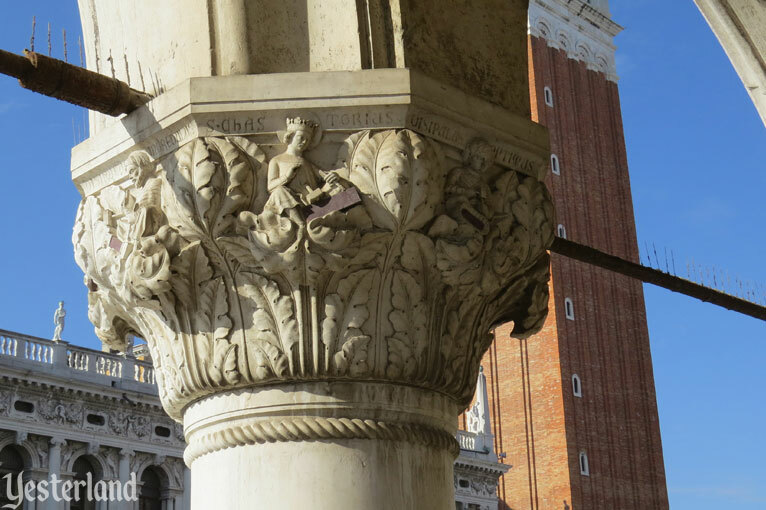 The capitals on the columns in Venice are hand-carved stone, with no two capitals alike. The capitals at Epcot came out of a mold and they repeat. But they look great anyway. The red brick Campanile is the bell tower of the Basilica San Marco (St. Mark’s Basilica), which is in the background of the photo from Italy. The tower is believed to have been built in the ninth century. It collapsed in 1902 and had to be rebuilt. So, oddly, the real and Epcot versions are both twentieth century copies. 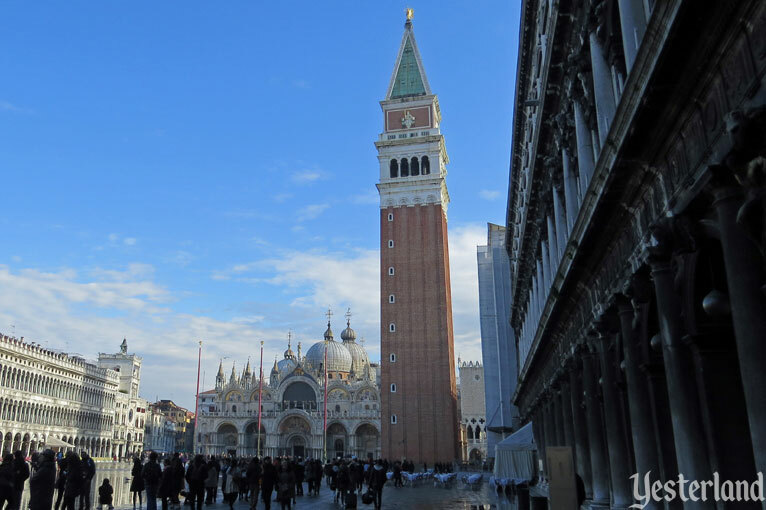 The real Campanile di San Marco in Venice is 323 feet tall. The Epcot version is 100 feet tall. 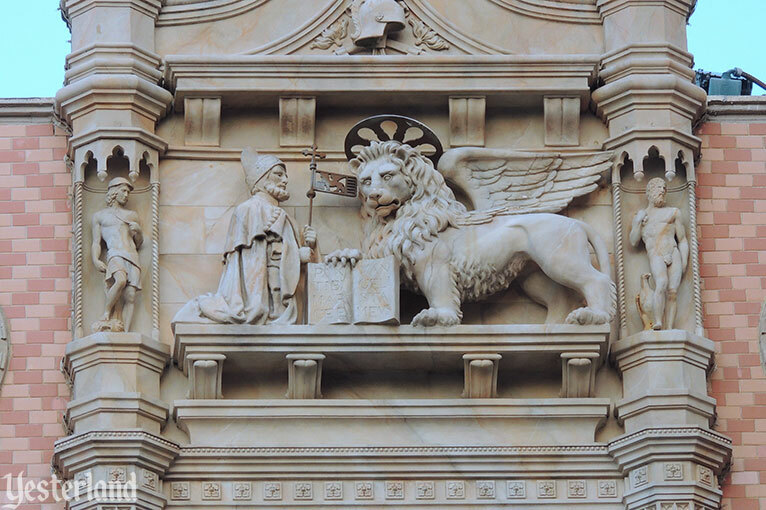 Doge Andrea Gritti, representing the state, kneels before the Lion of St. Mark, representing religion. The book symbolizes the sovereignty of the state of Venice. 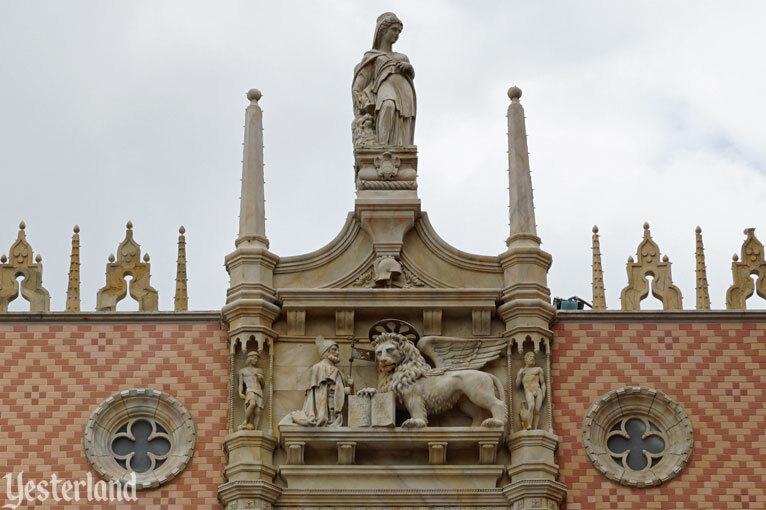 In Venice, the sculpture is on the façade of the palace facing the Piazza San Marco. 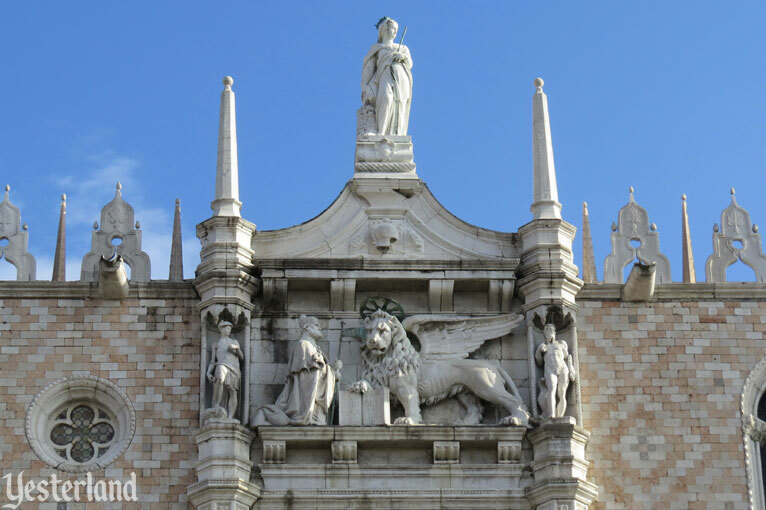 A similar sculpture with a different Doge (Francesco Foscari) is above the Porta della Cart, which connects the palace to the basilica. 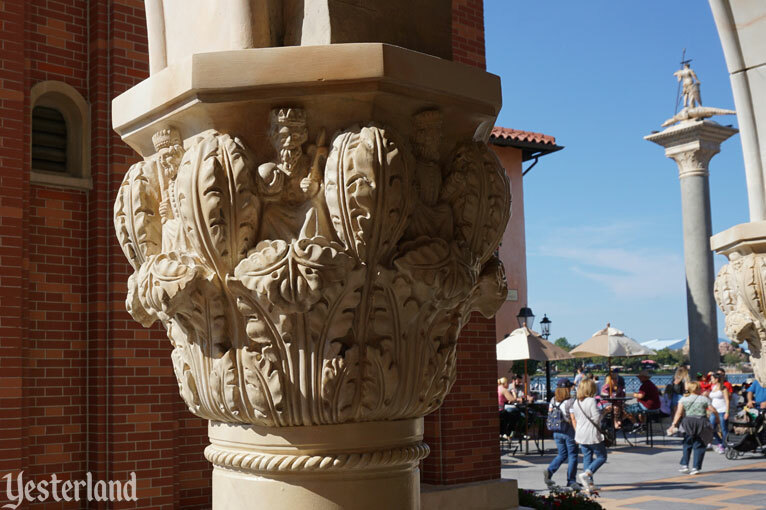 Epcot repeats the same sculpture on both main façades of Il Bel Cristallo. At first glance, the real and Disney versions look similar. But look at the kneeling Doge in each photo. In the original, the size of the Doge’s head and the proportions of his body under the robe seem off. Is the Doge kneeling or standing? The Disney version clearly shows a man who is kneeling. Possibly, Disney’s Doge is just a shorter man. Also, the Disney lion seems friendlier. Venice, Italy has around about 400 gondolas. 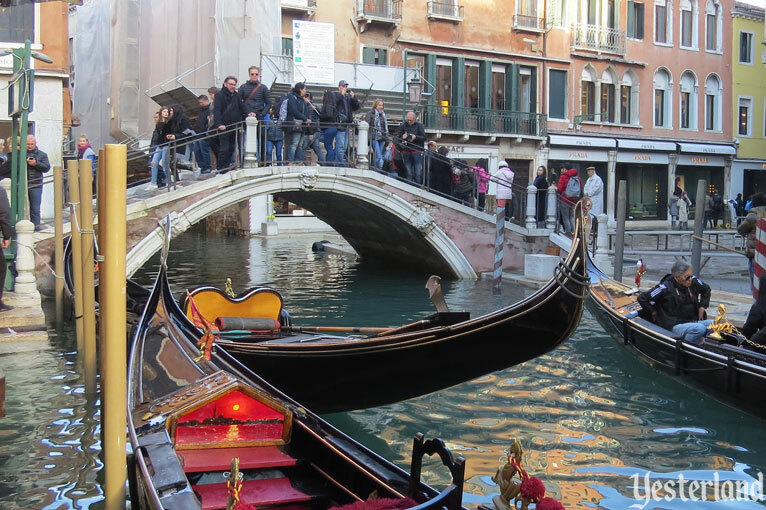 These graceful, motorless boats were once the primary form of transportation in Venice. Now they almost exclusively serve tourists. There are less expensive, more efficient ways to get around. 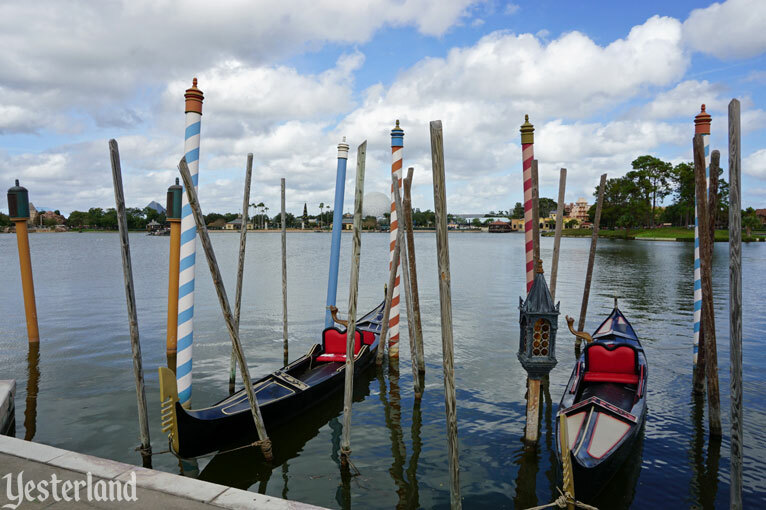 Italy at Epcot has three gondolas, but only as props. 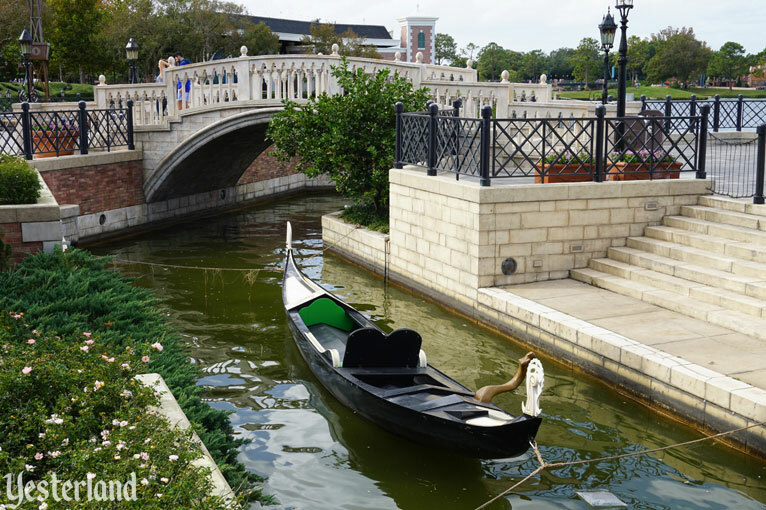 Epcot has no gondoliers—not even for guests who might be willing to pay big bucks for a personal ride on World Showcase Lagoon with a singing gondolier and a bottle of Prosecco. 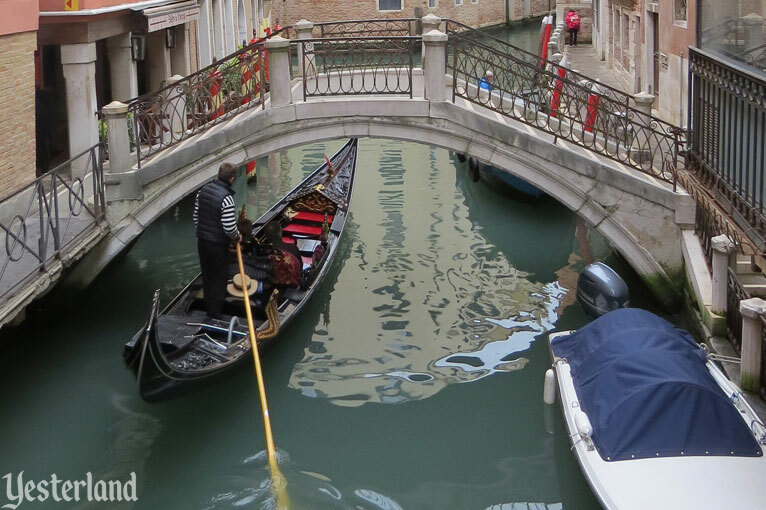 Venice, Italy has 30 miles of internal canals and waterways. It’s what the city is famous for. Actually, a number of cities have more miles of canals, including at least three in Florida. Fort Lauderdale and Port Charlotte each have 165 miles of canals. Cape Coral has a mind-boggling 400 miles, making it the city with the most miles of navigable waterways in the world. Even Birmingham, England, with 35 miles of canals, beats Venice. But, arguably, Venice wins for the most beautiful urban canals. Italy at Epcot has just one canal. It’s very short—about 150 feet long. 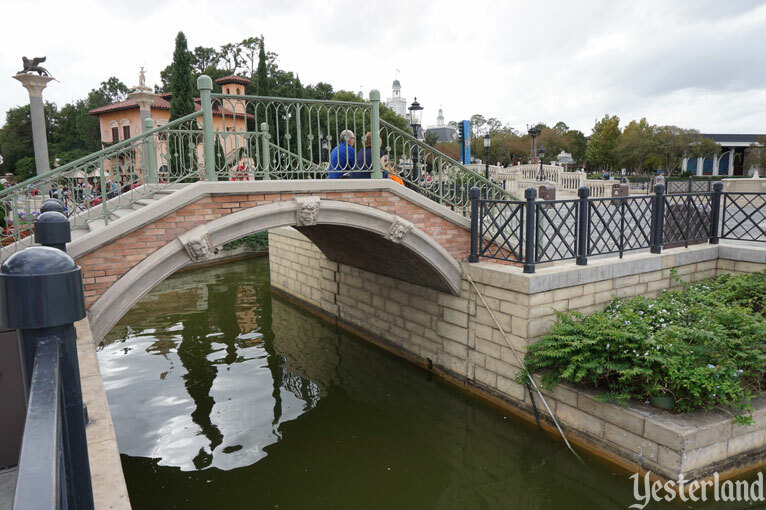 The canal forms a small island on the edge of World Showcase Lagoon. 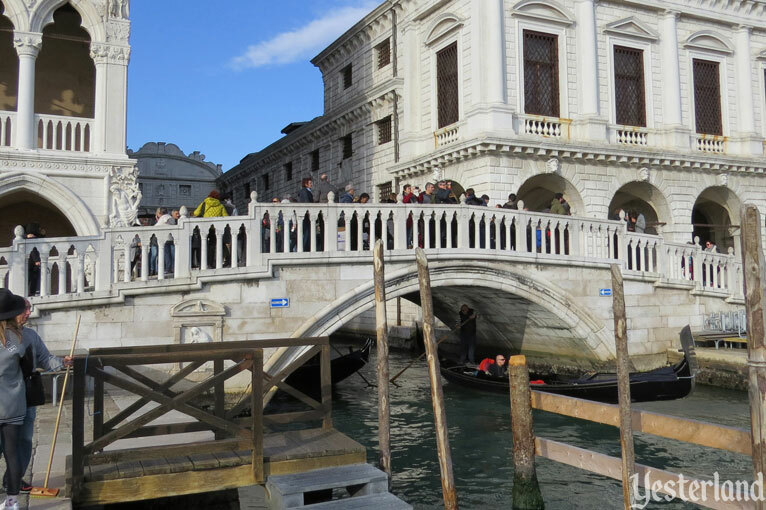 One of Venice’s nicknames is the City of Bridges. Given its many canals, it’s not surprising that there are many places to cross them. Ponte della Paglia is near the Palazzo Ducale (Doge’s Palace). 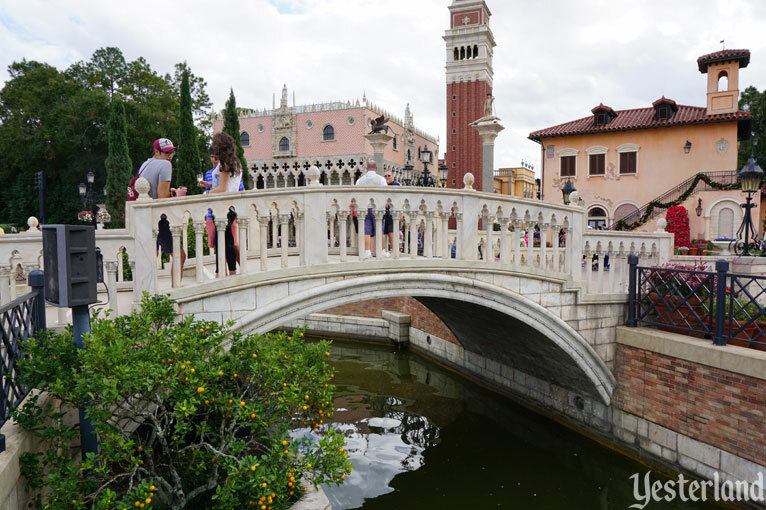 Italy at Epcot has three bridges crossing its little canal. Two of them, with significant arches and steps, have been there since opening day. The third, which has no steps and is relatively flat for accessibility, was added in 2007. They all go to the small island. In Venice, Ponte San Moisé crosses the San Moisé canal, adjacent to an elaborate historical church and high-end stores, including Versace and Prada. 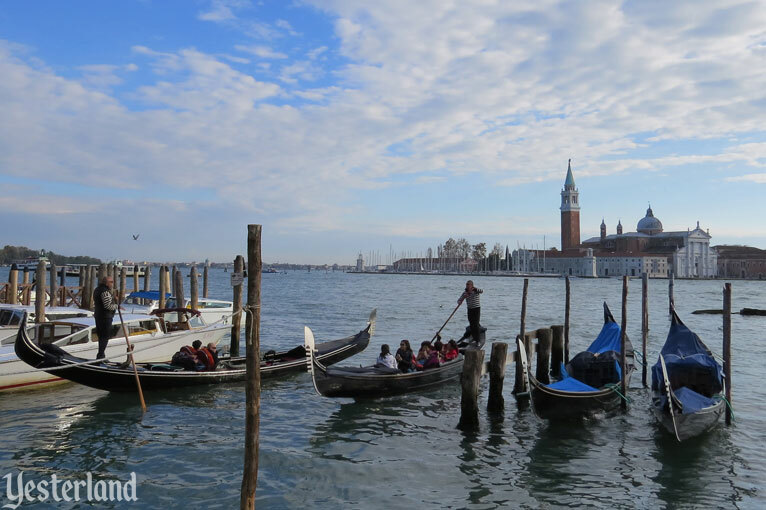 At the base of the busy pedestrian bridge, gondoliers load passengers at one of Venice’s few official gondola stands. The Epcot version of the bridge gets much lighter use because it only goes to the small island that nobody really needs to go to, except to explore that part of the waterfront or to attend a private event. We now bid arrivederci to Italy—both of them.